New York City had been held firmly in the grip of what appeared to be the start of a new Ice Age. At least 6 weeks of temperatures well below freezing, and mountains of snow alongside every road growing higher by the day. Even the Hudson River flowed beneath a mosaic of ice. Against this backdrop, I was delighted to receive a meeting request that required a trip to San Francisco. I knew little of California in March, but my mind painted images of blue skies, turquoise seas and the smell of spring flowers. I could almost feel the warm spring sun on my face. I booked flights and managed to take in a weekend at leisure, before the meeting. I booked in to a small guesthouse for the weekend. It was a short bus ride from the city center, on the perimeter of Golden Gate Park. 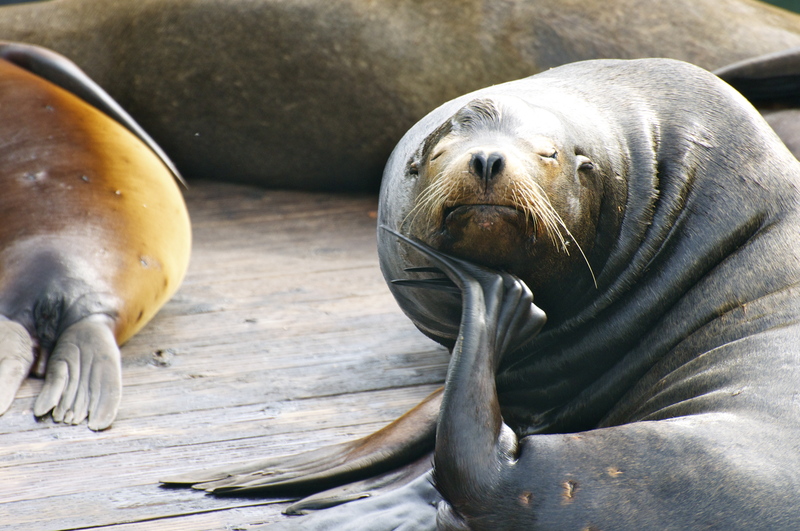 Unusually, I had not researched the birds of San Francisco, but I knew that I wanted to see the California sea lions at Pier 39, and assumed that being close to the park I would give myself an opportunity to see some new bird species. After a Friday night-flight, I got up, had breakfast and headed out on Saturday morning, fuelled with coffee and armed with a pocket sized pair of binoculars, my camera and some comfortable boots, with a plan to walk through the park to the Golden Gate Bridge and then get a bus to Fisherman’s Wharf. First stop was the Japanese Tea Garden. Just outside the gate I spotted a new bird moving in the undergrowth. It was a Fox Sparrow, and my first “tick” of the trip. I stood watching it feeding when something small and fast moving caught my eye. I had seen a hummingbird a few years ago in Cuba and was enthralled with how these perfect little birds move, feed, fly and by the brilliance of their feathers. I was determined to see more species while in America. I didn’t think my chance would come so soon. Immediately, I recognised that the tiny dark bird I was looking at was a hummingbird. I fixed the binoculars on to it; dark green body and black head. I moved closer, and the bird turned to face me. As if by magic it lifted the black feathers on the head and face turning them an indescribable metallic pink. It was breathtakingly beautiful! I fumbled for my camera and zoomed in snatching a quick shot before taking a series of blurry dark smudges as the bird darted out of sight. 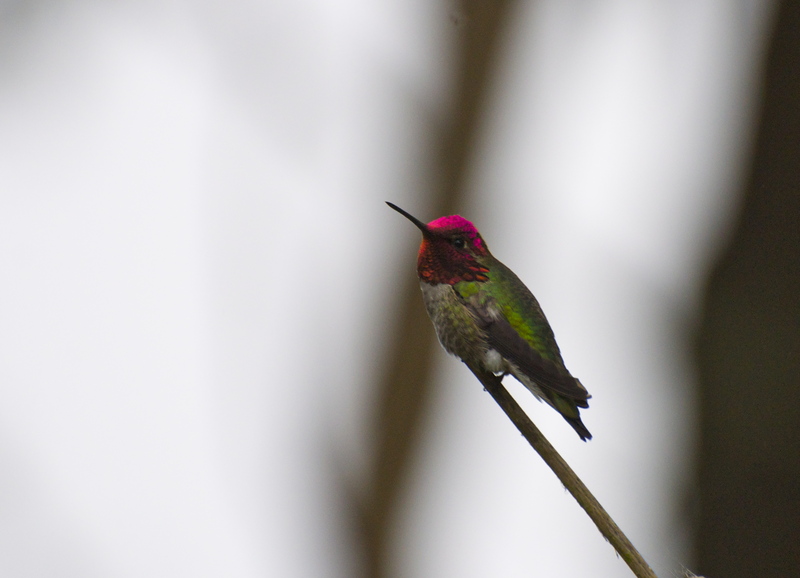 I had seen my first Anna’s Hummingbird, a West Coast resident and an ever-present inhabitant of Golden Gate Park. Inspired by my sighting, I stopped briefly to enjoy the obligatory cup of tea in the Japanese Tea Garden before heading into the Botanical Gardens in search of a further hummingbird photo opportunity. The weather moved from warm sun to cloud cover and light rain. I knew this would not be ideal for photographing small fast-moving dark birds in flight so I set the camera speed as high as I could and turned the ISO up to 800 to give myself the best chance. The Botanical Gardens were a warm explosion of colour and perfume. The perfect hummingbird hunting ground and so it proved. 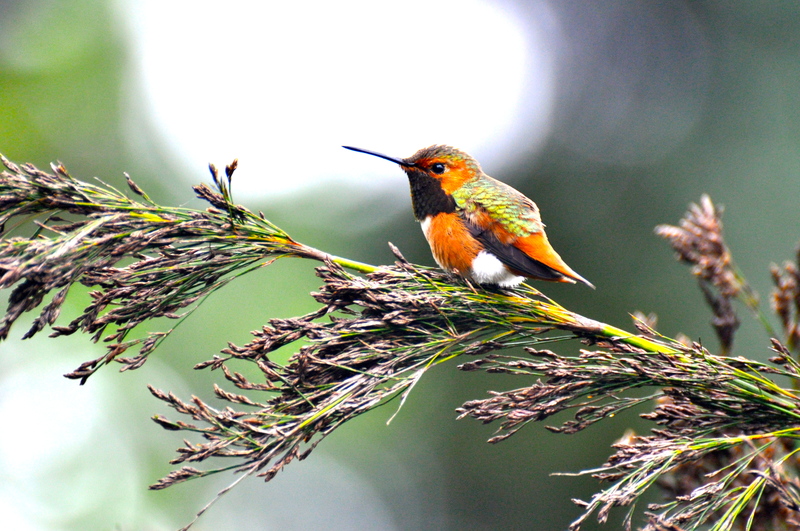 First a brief, and only glimpse of the magnificent Rufus Hummingbird on migration northwards. I watched an energetic male perform an elaborate aerial display, no doubt to a hidden watching female. He swooped in curves before rising high in the sky until almost out of sight, before plunging down at impossible speeds in to a low arc, back to his perch. Too fast and too high for my limited photography skills. Next came Allen’s Hummingbirds; at a tiny 3 to 3.5 in (76 to 89 mm) in length, this summer breeding resident could be sighted at each turn. It seemed like every fresh blooming flower had an Allen’s Hummingbird in close proximity. I stood beside a Veld Fire bush as a male returned to the same flower, a fresh bloom opened only that morning, until he had either taken his fill or drained it dry of sweet nectar. I meandered through a small wet area where a shallow pond was chocked with reeds. Two female Allen’s Hummingbird took turns to strip an ear of Reed Mace of its soft downy seeds, for use as nest lining. The delicate seed heads make a perfect, woven cushion for supporting two tiny white eggs. 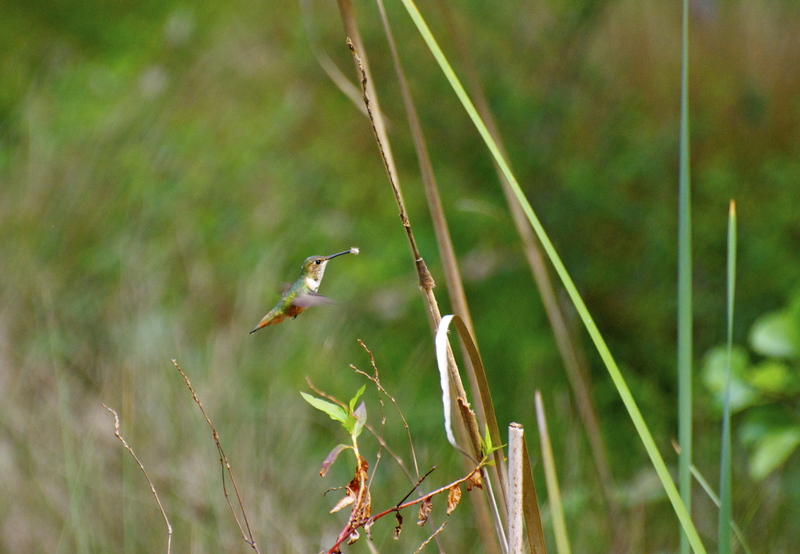 Hummingbirds have been a source of fascination to me in books and wildlife documentaries for many years. Their fast, jerky movement, loud buzz of fast wings and iridescent feathers are associated with exotic places and far-away lands. I didn’t dream that I could see three different species in one day in the comfort of an inner city park in a major city, San Francisco. I could have stayed with them all day, and indeed did spend most of the day just watching these little jewels go about their business. I manage to drag myself away in time to catch the last of the daylight at Pier 39 in the company of the wonderfully boisterous and smelly California Sea Lions. By the end of Sunday evening I had ticked off 28 new species of birds. Not bad at all for an incidental weekend away, tagged on to a work trip. Wildlife is all around us waiting to be seen if we care to look for it. I am delighted to hear that my timing was fortunate. I knew the Rufous was passing through, and certainly counted myself lucky to see it. Lovely work, David, especially the Allen’s. I, too, can’t stay away from the sea lions whenever I’m in that part of the country. I used to pass through fairly regularly, but now it’s really seldom. Love the expression of this one with its chin apparently resting on its flipper as it contemplates you!